Storm is lifting. 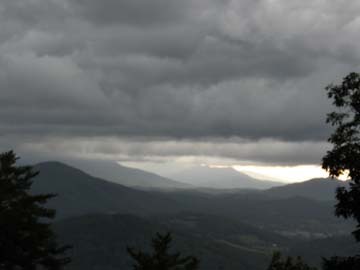 View from the temple at the Great Smoky Mountains Peace Pagoda. Saturday, May 15 at 11 a.m.
Saturday, August 14 at 11 a.m.
A Peace Pagoda is a Buddhist stupa that seeks to unite all us sentient beings, regardless of race, creed or nationality, in the universal aspiration for genuine World Peace. Just like stupas built since the time of Buddha Shakyamuni, Peace Pagodas entomb relics of Lord Buddha. Ever since our teacher and founder, the Most Ven. Nichidatsu Fujii, first received Buddha relics in 1933, he vowed to build stupas in Japan and around the world for the sake of world peace. After the devastation of Hiroshima and Nagasaki by atomic bombs brought a wretched end to the horrors of World War II, Guruji was able to first realize his vow with the dedication of the Hanaokayama Peace Pagoda in Japan in 1954. Since that time, more than 80 Peace Pagodas have been built around the world by Guruji and his order of Nipponzan Myohoji. Inspired by the traditional designs of the stupa, most Nipponzan Myohoji Peace Pagodas reflect the original Indian style of a dome-shaped building topped by a spire. The Buddha himself instructed his disciples to build such stupas to enshrine his relics after he passed. 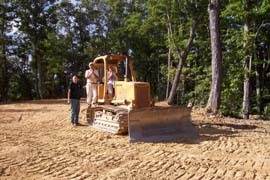 While some might say the stupa represents the Buddha, our understanding is that through the collective effort of building the Peace Pagoda, we are creating the Pure Land and that the Peace Pagoda is, in reality, Lord Buddha's presence. 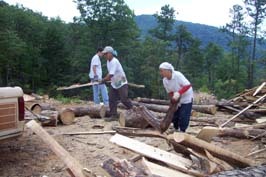 Every project at the land is a contribution towards the manifestation of the Peace Pagoda so the work is ongoing. So far we have built a temple, a Stone Pagoda [Gendai Hoto], guest quarters and gardens. 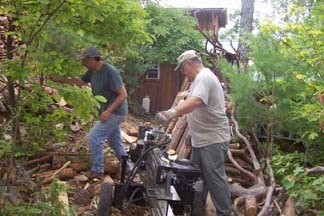 Currently we are working on a Spirit Garden (see below), which will be completely this year. 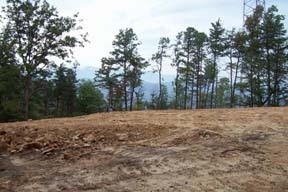 Foundation work on the Peace Pagoda is expected to begin next year. 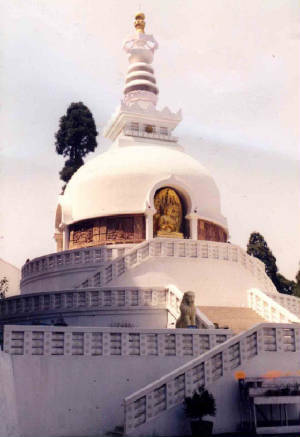 A Peace Pagoda is a large structure, around 100 feet tall and 90-100 feet in diameter. 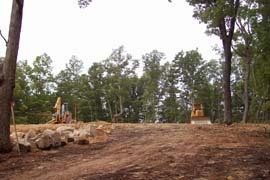 Upon its completion, the Great Smoky Mountains Peace Pagoda will be visible from miles around, including to those traveling through East Tennessee on Interstate 40. Our plan is to copy the design of an existing Peace Pagoda in Darjeeling, India, pictured here on the left. 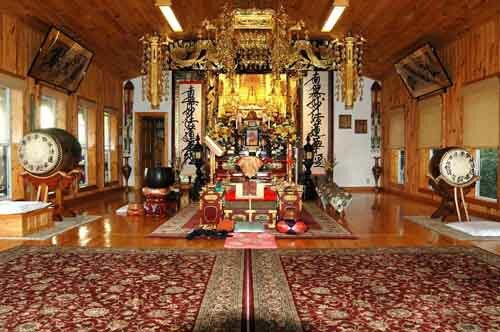 Two Peace Pagodas have already been built in the United States. 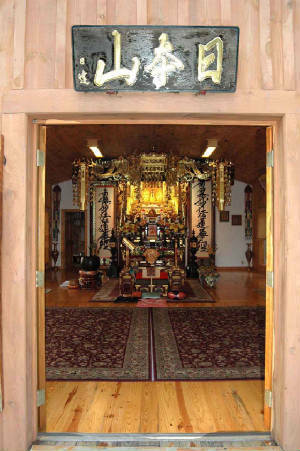 The New England Peace Pagoda in Leverett, MA was inaugurated in 1985. 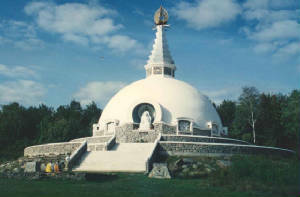 The Grafton Peace Pagoda in upstate New York was dedicated in 1993. 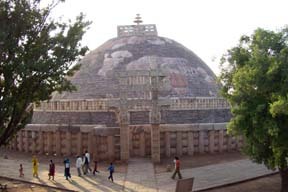 Sanchi.Here is a stupa (Pagoda) built more than 2,000 years ago. 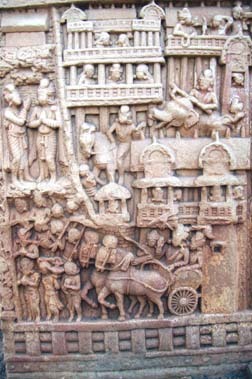 Stone carving detail from the Sanchi gate. Modern stone carving at the Darjeeling Peace Pagoda. 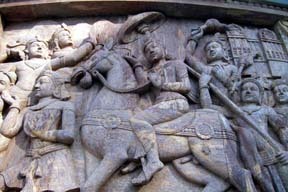 The TN Peace Pagoda will have similar carvings. 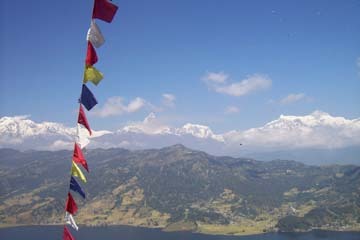 Pokhara Peace Pagoda and view of the Himalayas from the same Pagoda. 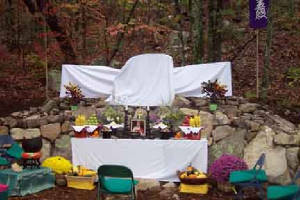 We dedicated the Spirit Garden on October 18, 2008, an overcast day but the clouds parted and allowed rays of sunshine to pour into the forest just as the ceremony began. 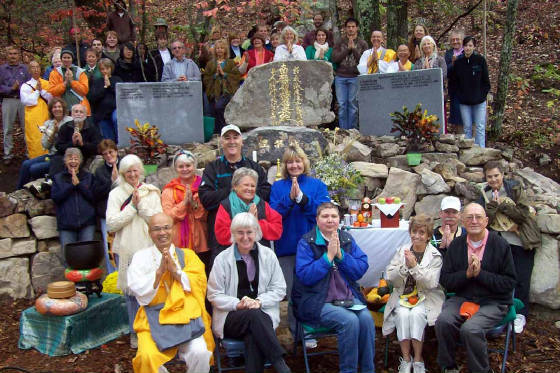 Approximately 75 people attended the dedication in which the ashes of Utsumi Noburu and Hanayo (Utsumi-shonin's parents), Robert and Maureen Laffan (Sr. Denise's parents), Joseph Kugler, Julia Geiger and Peg McIntire were interred. The shrine stone is from our mountain and is inscribed with the sacred mantra, Na Mu Myo Ho Ren Ge Kyo. The memorial stones with the names of the deceased are granite. 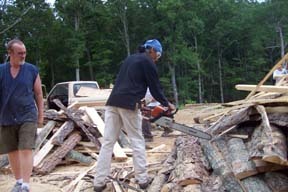 All the carving was done by hand. 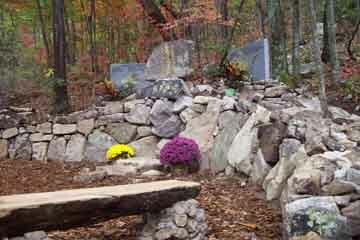 The Spirit Garden has a tomb with a common area which can be added to as needed. 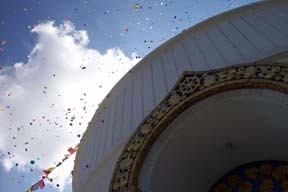 It is for everyone connected with the Peace Pagoda, whether Buddhist or not. 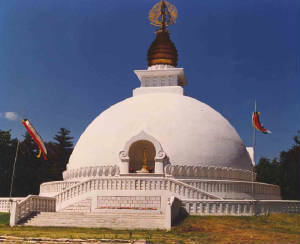 It is located in the woods on the Peace Pagoda land, and the tombs sits at the highest point within a ceremonial stone circle. The floor of this tomb is dirt, allowing the remains to return to the earth over time. 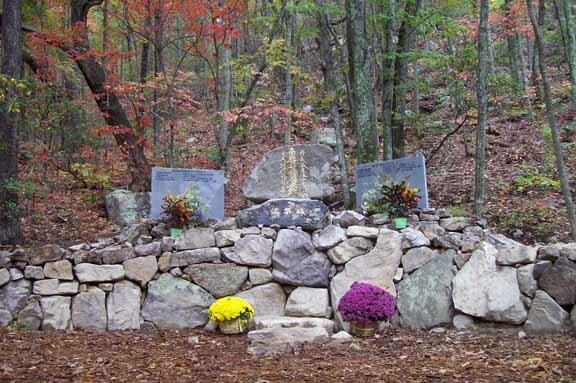 Not far from this stone circle are the remains of a old moonshine still, giving the name Spirit Garden a double meaning. Rustic benches have been added to allow this area and the memorial area to become places for meditation. 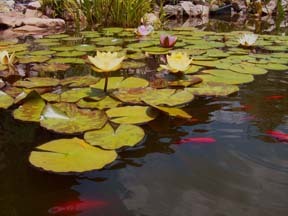 Taken at the conclusion of the Spirit Garden Dedication. Shrine stones are veiled prior to the ceremony. 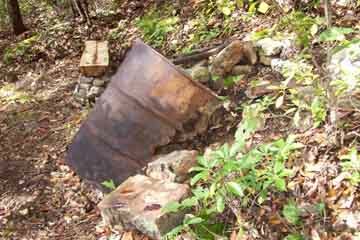 The ruins of a moonshine still lay nearby. Please click here for directions to the Peace Pagoda.